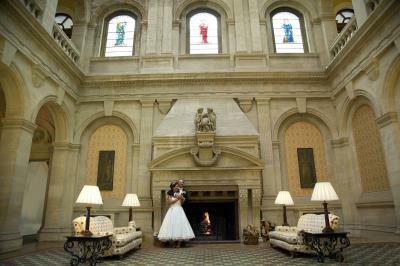 Heythrop Park Resort has 2 hotels onsite to choose from. If modern, contemporary and stylish is your thing then the Crowne Plaza hotel is the one for you. If you prefer the grandeur of a country house then the 18th century grade II listed mansion house is a more suitable fit. The historic Mansion House, built in 1703 for the 1st Duke of Shrewsbury combines elegance with style and can also be hired exclusively for private use. Both hotels share the 440 acres of grounds & gardens which can be used for Alfresco drinks & canape receptions in the Summer. We have four rooms which are licensed to hold ceremonies and a number of suites to choose from to hold your reception from small intimate parties for 10 guests to The Ballroom which can accommodate up to 300 guests. Heythrop Park Resort is beautiful all year round. The 440 acres of grounds provide the perfect backdrop for those all important photographs from the rustic golds and browns in the Autumn to the Bluebell woods in the Spring. Our packages and menus have all been created to reflect the changes in season.